Hi there! 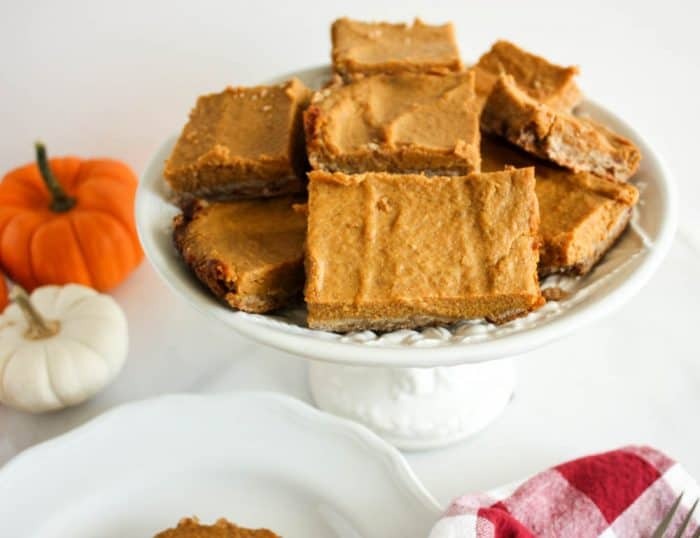 I’m Allie with Miss Allie’s Kitchen, and I’m so glad to be sharing my recipe for these nourishing & healthy gluten-free Pumpkin Pie Bars this fab fall season with all of you! Pumpkin. Fall. Spices. Do we really need anything else in this life? I certainly don’t think I do! 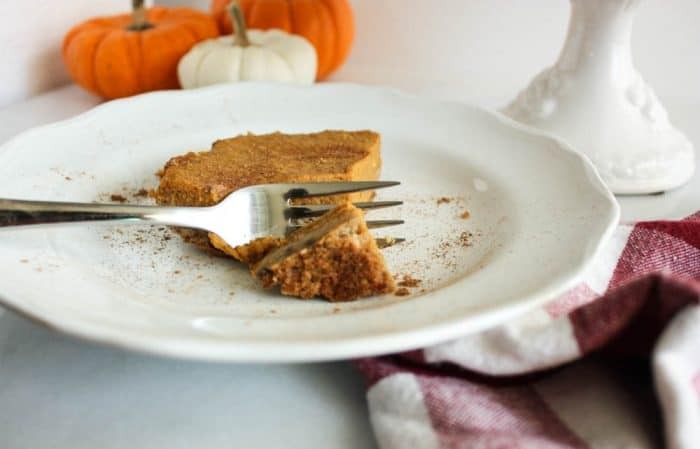 In my family, Pumpkin Pie is the star of the season. Has anyone else ever snuck down the stairs on a Saturday morning, brewed a cup of steaming coffee, pulled back the crinkly saran wrap, and dug into a dish of pure pie heaven directly from the pan? Yeah? Me too! 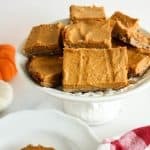 I am all about treating ourselves, but isn’t it amazing when one of our favorites can not only satisfy our sweet tooth, but nourish our bodies, too? We’ll start today by making my favorite oat-date crust (which is incredibly versatile). I love using oats because they are such a healthful and filling ingredient. If you don’t believe me, this compilation of 37 Overnight Oat Variations may change your mind. 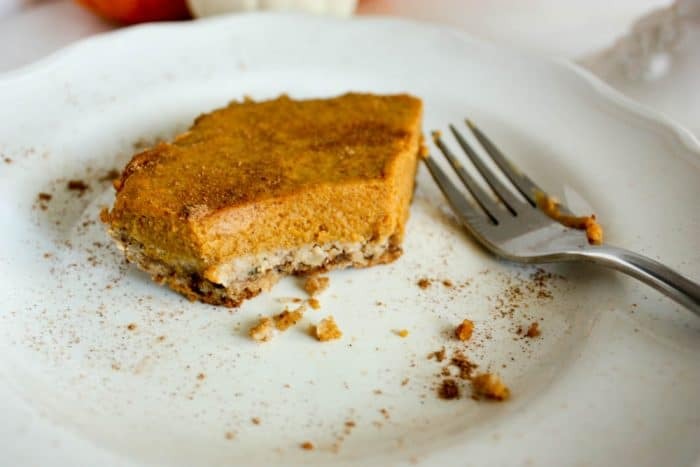 The pumpkin pie filling is as rich & creamy as it’s traditional counterpart, but the maple syrup & Greek yogurt really up the protein content while enhancing that pumpkin pie spice punch – without the refined sugar. 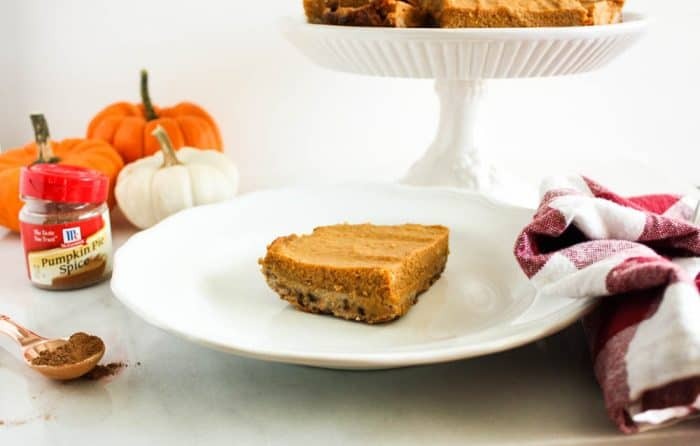 Moral of the story – we can stop guiltily hiding those early morning pie indulgences & start embracing the easy and flavorful swaps in your pumpkin filled pie bars. OK, bakers START YOUR OVENS! Pre-bake the crust in the oven for 10 minutes. In the meantime, prepare the filling. 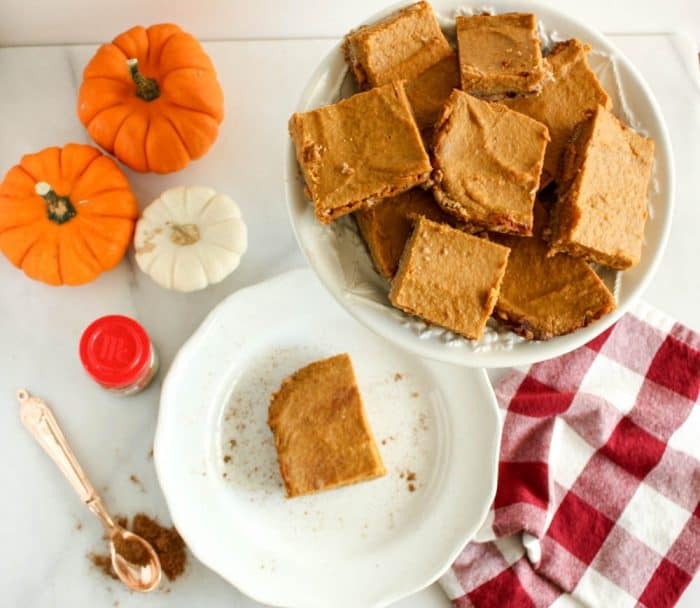 Pour pumpkin puree, maple syrup, cashew coconut milk, cornstarch, vanilla and spices into a bowl and whisk lightly. Beat your eggs, and pour into the filling mixture. Whisk everything together well. 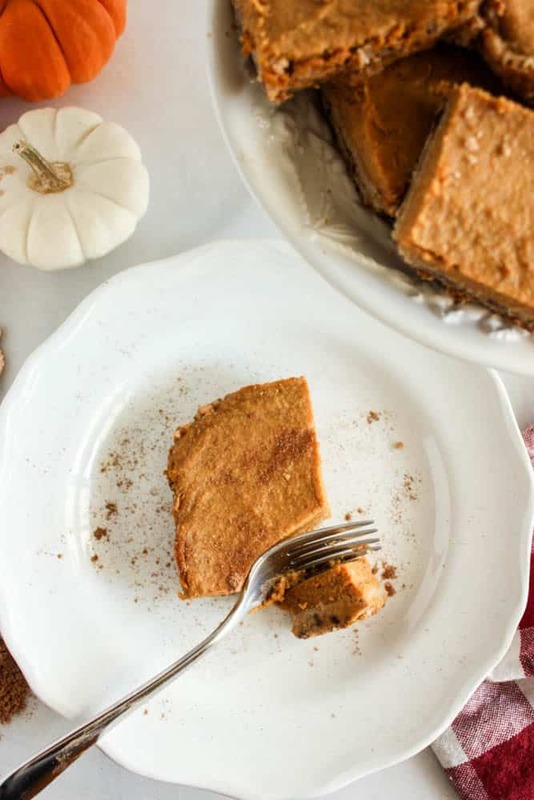 Are you looking for the perfect Fall dessert? 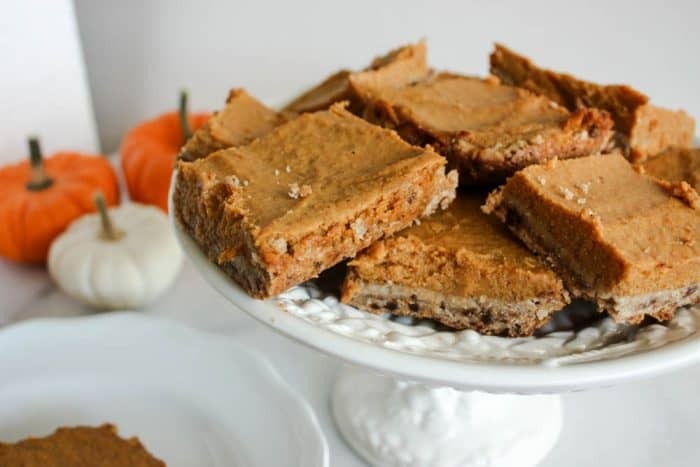 These Pumpkin Pie Bars are gluten free with no refined sugars so you can feel better about splurging. Preheat oven to 375 degrees. Let's start by making that oat date crust - you'll need a blender or food processor. All you'll do to make the oat flour is place 1 cup of oats into the blender/ processor and pulse until it is finely ground. Next, add the walnuts, dates, maple syrup, and coconut oil. Blend this until everything is glossy, sticky and combined. You may have to stop the machine and scrape the sides a few times. Add the rest of the whole oats, mix and push into a baking dish greased with coconut oil. Pre-bake the crust in the oven for 10 minutes. In the meantime, prepare the filling. 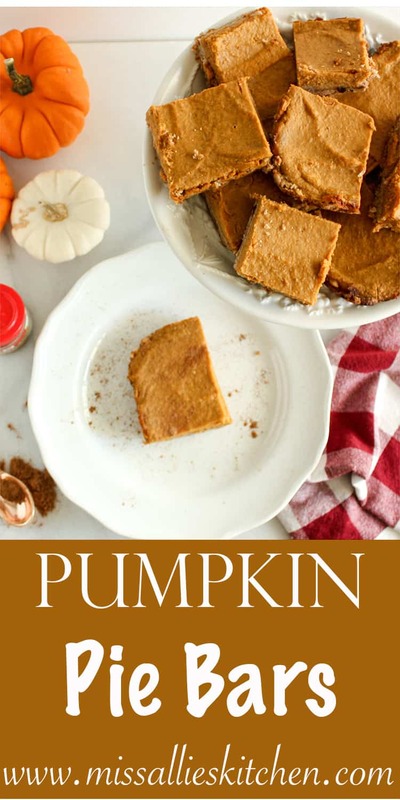 Pour pumpkin puree, maple syrup, cashew coconut milk, cornstarch, vanilla and spices into a bowl and whisk lightly. Beat your eggs, and pour into the filling mixture.